Home » » IT-6WTH.PDF | Do You Really Need It for Non-resident Withholding? IT-6WTH.PDF | Do You Really Need It for Non-resident Withholding? Do you need to file IT-6WTH? In my experience, searching for IT-6WTH.PDF can lead to a lot of dead ends. It is not found on the IN.gov withholding tax forms page as of the writing of this post. I wanted to share my experiences with partnerships filing an Indiana return involving non-resident partners. The question comes down to withholding tax for non-resident individuals who are partners on the composite return. So let's say there is a partnership from another state or country operating in Indiana. If the partners are individuals, they will have to be reported on the partners composite Indiana adjusted gross income tax return. The partners have to be reported on this document yet they can opt out of the Composite return by checking the box G for each partner that would like to pay the tax liability on an individual return. If box G is checked on IT65 comp, the partners will have to fill out form in-compa and the partnership will have to keep the form which is an affidavit on hand at all times. The affidavit basically states that the individual has the ability and will pay the Indiana tax on an individual return. Now suppose the partnership files their return and pays the individual taxpayer's liability. Furthermore, the individual files an Indiana return. What is to be done about the withheld tax does a partnership has already paid? 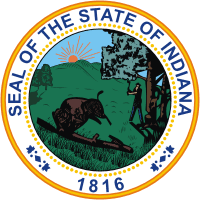 "unless they have income from other Indiana sources, individual non-resident shareholders are then relieved of the obligation to file an individual adjusted gross income tax." This is of course if they have been identified on the IT - 65 comp and the partnership has paid the income tax liability for the individual non-residents. If an individual has filed a personal non resident income tax return for the state of Indiana when they have no other income from Indiana but that of a partnership which has paid the tax liability already, in my experience, they will need to amend their Indiana income tax return To omit the financial data relating to the partnership. To summarize, a partnership who is made up of individuals who are non residents of Indiana can pay the partners income tax liability through the Indiana schedule it - 65 comp, but the non residents individuals should not file an income tax return with the state of Indiana. The other option is to opt out of the it - 65comp filing requirements by using schedule in-compa. The non resident individual shareholders are then responsible and must file a State return for Indiana. Please remember if there are sources of income other than the partnership the taxpayer is receiving, this will not work. Every situation is different and you should do your own investigating and consult a tax specialist before choosing how to file personal and partnership tax returns in Indiana, as well as filing IT-6WTH or IT6-WTH.PDF files. Contact Borders Bookkeeping in the Coachella Valley, California for more information.